Regarding Paddy Gower, I had to laugh at his comment a few nights ago that "they are really drinking the kool-aid here." That knee is full of iron, though I doubt Gower comprehends that. So much for my estimate of when Trump would speak, they do go on... – I couldn’t wait and had to go out – so gawd knows what time he started and I just got home and heard he only just finished talking – at midnight EST.!! True dat. For my money, Laurie Penny conveys manages to convey more than a mountain of mainstream pundits. Well, the situation with Meredith McIver just got serious for Trump. He's now alleged to have broken federal elections law by having a corporate employee carrying out duties on his campaign. Rock and hard place - either McIver really truly does exist and Trump is guilty, or he has to admit he made her up, so there's no case to answer. Either way, he's going to have a harder job painting Clinton as lawbreaker and liar. Not that that will stop him, of course. Melania does not look happy, smiling only when she realises the camera is actually on her. Not that that will stop him, of course. No, it won’t becouse once the mob pics up the pitch forks, reason gets drowned. And he’s already got the mob tracking like a freight train. It’s got some dangerous inertia. The Republican Party nominated Donald Trump as its candidate for president of the United States - and I responded by ending my 44-year GOP membership. I hope his feeling spreads. Trump tried to step back from the mob in his speech. Cries of "lock her up" are no longer what he wants to hear - watch his body language when they start baying. As always, those who first stoke the fires to get attention, cannot then look convincing as the fireman (or to mix clichés: genie, bottle, reap, sow etc). A.Eger Leintz 1902. 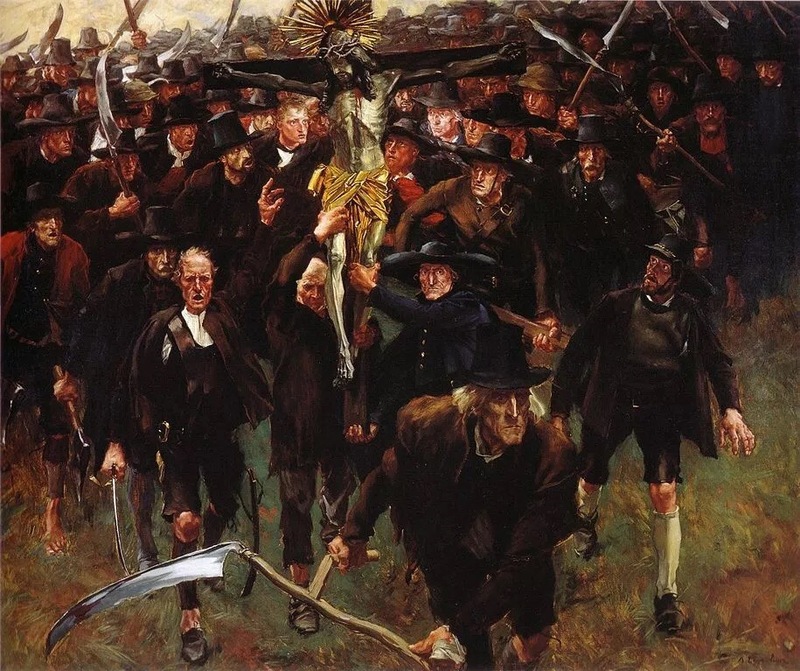 Austrian painting captures the spirit of the following decades. It’s got some dangerous inertia. My biggest fear with all this is 'what happens next?' Even if Trump loses, I really doubt that everyone is going to then pack up quietly and go home. Same with Brexit. Thanks for the picture ID. It's an image that's stayed with me since it featured in an article in US Penthouse in the early 80s on the rise of the then-new American fundamentalist right. Can't recall the author, only that the striking image was copyright credited to an Austrian state art gallery. Then again, Pipes endorsed Ted Cruz, who's equally insane as Trump but for different reasons. They ventriloquise the fear of millions into a scream of fire in the crowded theatre of modernity where all the doors are locked, and then they watch the stampede, and they smile for the cameras. How many millions? Not enough to win, just enough to make others wake to the danger. I hope. Then again, Pipes endorsed Ted Cruz, who’s equally insane as Trump but for different reasons. I thought he wasn't endorsing Trump for obvious reasons. Then he revealed he only did it becouse Trump dissed his wife and by default himself. The Washington Post's withering, comprehensive denunciation of Trump. It's also worth checking out Jon Stewart's RNC rave when he guests on The Late Show. It’s also worth checking out Jon Stewart’s RNC rave when he guests on The Late Show.